Early summer rates for 5 nights, 5/28-6/2!! Beachfront/gorgeous view!! Vibrant Colors - Fantastic Views and FUN! Free Internet Connection...FREE FUN...Is yours in this 6th floor upscale colorful unit with ten-foot ceilings, crown molding, granite counter tops, and wet bar. This 6th floor beautiful condo is the best bargain in Orange Beach. We have the .cheapest rates for any condo of this quality, location and view which makes it the best bargain you can find anywhere! Check our last minute. specials. From your private balcony in this Gulf-front complex, take in the PANORAMIC, UNOBSTRUCTED VIEWS of the Gulf of Mexico,...Perdido Pass,... Perdido Bay,...and Ole River. The master bedroom and the living room have large sliding glass doors opening onto the deck. There is ample colorful, comfortable deck furniture. Welcome to the best view in Orange Beach! Watch boats of all sizes and price going to sea and returning as the sunset. 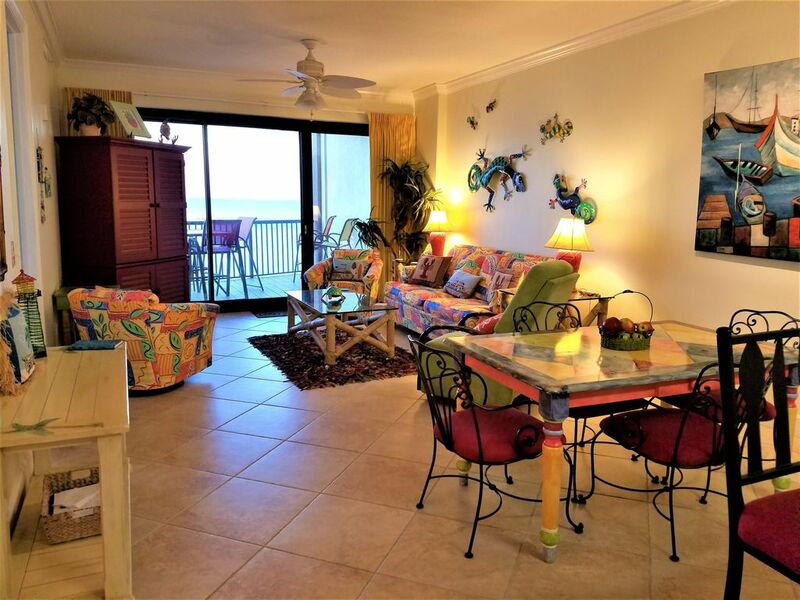 This beautifully decorated CARRIBEAN-BEACHY get-away has updated stainless appliances, comfortable, colorful furniture and a large deck. You will have access to a very good workout room! Steam Room! Sauna! Indoor heated pool ,an Outdoor Pool, and two whirlpools. Grand Pointe is a low-density complex which sits back from the road with no high rise next nearby, giving you PRIVACY. Orange Beach's finest WHITE SANDY BEACH becomes your private playground. At times you will have the beach virtually to yourself. Fine FISHING is steps away on the property right off the jetty. Some of the most famous RESTAURANTS in Orange Beach are just across the street and dozens of others are just minutes away. NO SMOKING Please!!! Living Room - Sleeper Sofa with extra thick mattress. There really is something for everyone at our unit at Grand Pointe in Orange Beach. EXCITEMENT, DINING, RELAXING, or SEA ADVENTURE waits for you! Check our calendar for availability. THE VIEW! There is nothing like it in all of Orange Beach. It's pure relaxation to sit on the deck and watch the boats go out to sea and return. You see the Gulf, the Pass and Perdido Bay all at the same time! Our decor is fresh, beachy and fun! Also, we love the upscale quality of Orange Beach as well as having so many excellent (upscale, rustic and all you can eat) restaurants nearby. Master Bath has two sinks, a walk-in closet as well as a linen closet. Also a jacuzzi and walk in shower. Full set of bed linens, towels and kitchen cloths. Utility Room with full size washer and dryer in unit. No beach towels are provided. We have a sofa that seats 3, 2 swivel chairs and a rocking recliner. Large stainless steel finish with ice and water dispenser in door. There are start up filters for the coffee maker and start up dishwasher tablets. We have a very well furnished kitchen with dishwasher, refrigerator, coffee maker, blender, microwave and flat surface stove. Dining area table seats 4 and seats 4 at the bar. We have a very large balcony that seats 6 and we have 2 recliners. We have a large deck with seating for 6 and 2 recliners and a table. The condo was just as described and perfect for us. The building itself was not too big and had all the amenities we needed. Excellent property. Great little condo. So conveniently located and great views. We really enjoyed how it was decorated as well. Family had a great time and wanting to plan a return trip to this wonderful property. Thanks so much. So glad you enjoyed it!! Always nice to hear guests had a good time would like to return!! Thanks so much! This is our 3rd stay @ this lovely, condo. We are snowbirds and have stayed 2 months or more the past three years. The condo is comfortable & the decor is so fun! We love the view of the pass, seeing the dolphins swimming & the boats going past. Did I say the beach? It is absolutely amazing! We love to walk the beautiful, clean Gulf beach! Julie is very easy to work with and makes sure everything is all set when we arrive. There are so many great places for dining out or for shopping. If you want to go out fishing; there are charters across the street @ San Roc Cay that go most every day. This truly is an awesome place to vacation any time of the year! Pensacola & Mobile are also great places for dining, shopping, & attending music & art events. We highly recommend this condo! Thanks so much for choosing our condo again!! We love our repeat guests!! It sounds like ya;ll enjoy the condo as much as we do and I am delighted to hear that!! We do feel we have a great view in an awesome location!! We always like to hear that our guests are enjoying our condo!!! We look forward to your return again!! ALL GREAT. HAD A WONDERFUL TIME. SUPER NICE CONDO. LOVED IT!!!!!!!! My family of 4 enjoyed our vacation here so much and we can’t wait to go back!! The room was spacious and very clean. It was convenient to grocery stores and restaurants. You have the amazing beach or you can go fishing to the side which is great if you enjoy fishing!! And the owner Julie was so nice and was wonderful to work with! I highly recommend this condo. I am delighted to hear ya'll enjoyed our condo so much!! We do think we have an awesome view with a great location!! I look forward to hearing from you again to vacation at our condo!! Thank you!! We had a great time, and had everything we needed. The owners were very attentive and helpful; we would stay here again! Delighted you enjoyed our condo!! We look forward to you vacationing again with us!! Thanks so much!! Please check these websites for up to date fun things, places to eat and activities in Orange Beach! If a guest chooses to use a credit card the following fees will be added to the posted rental rate. For U.S. citizens with a U.S. Bank account 2.5% for Visa, MasterCard, and Discover eChecks (electronic checks) with free processing for U.S. banks only. The first payment of $200 holds your reservation. When the full amount is paid 30 days prior to arrival the $200 becomes your damage deposit.